SIHH 2016: Presenting the New Richard Mille RM 50-02 ACJ Tourbillon Split Seconds Chronograph. Hands-on Live Pictures of the $1,050,000 30-piece Limited Edition Watch. As you all know, when Richard Mille launches a new watch he goes above and beyond to make sure that the new watch overdelivers in terms of design, looks, quality and craftsmanship. As we've seen it during its short history, Richard Mille is a brand that doesn't require any marketing gimmicks or celebrity endorsements to sell its watches. When they decide to partner with a someone, they are very careful on who they choose and why they are choosing them. With very few ambassadors, and all of them part of elite sports like tennis, Formula One racing and golf, Richard Mille has made a name for himself in a very short time. This week at the SIHH 2016 —Salon International de la Haute Horlogerie—, monsieur Richard Mille himself, welcomed us into his booth to review one of the most spectacular watches of the SIHH 2016. The new Richard Mille RM50-02 Tourbillon Split Seconds Chronograph is the product of a collaboration between the brand and Airbus Corporate Jets and is one of the most impressive Richard Mille watches we have ever reviewed. While up to date, Richard Mille had only tapped into the world of aviation for inspiration while using vanguardist materials, the brand is confident that their watches and modern aircraft design have a lot more in common. Airbus is a name that requires no introduction as a world leader in the application of novel approaches to aeronautical design, in particular those aircraft created for personal clients by its Airbus Corporate Jets —ACJ unit. Sylvain Mariat, Head of ACJ’s Creative Design Studio, drafted the designs for the RM 50-02 watch and has worked closely with Julien Boillat and Salvador Arbona from RM R&D Office. This new timepiece, just like the truly exceptional luxurious corporate jets built to the exacting and personal desires of clients by ACJ, makes use of advanced, open worked design elements in the internal design of bridges and baseplate in grade 5 titanium, along with an extensive application of skeletonization to every possible area, offering significant weight reduction. A number of parts within the movement have been coated with a distinctive, special aeronautical coating normally used to protect engine and chassis parts from corrosion and environmental conditions. The end result is a visually breathtaking and dramatic view of the technical interior of the split seconds chronograph movement which also technical repercussions such as the elimination of the initial jump of the chronograph seconds hand during starting and stopping, with new split seconds components also in titanium additionally lowering the chronograph’s energy consumption through the reduction of internal friction. Opposed to most chronographs, the pushers on the Richard Mille RM 50-02 ACJ Tourbillon are located in a very unique way. By depressing the pusher on the right at 4 o’clock, the user can stop the split seconds hand in order to read an intermediate time while the chronograph is engaged. Pressing the pusher again allows the split seconds hand to rejoin the chronograph, ready for the next measurement. On the left side of the case, two other pushers are located to activate the chronograph and to read the torque indicator. The very distinctive and novel case measuring 50.10 mm x 42.70 mm x 16.50 mm in Titanium-Aluminum alloy —TiAl— with a secondary white ceramic bezel was developed to mirror the outlines of an ACJ’s typical window shape with a clearly visible, multi-layered hull structure surround. This Titanium-Aluminum is the same alloy as that used in the Airbus for its jet turbine blades, which must function safely under the convergence of high temperatures and high fields of pressure, thus requiring a very strong and highly stress resistant material. A premiere for the brand, this is also the first time the iconic Richard Mille screws around the outer edge of the bezel have been replaced by Torq set® screws with their distinctively shaped head slots, and a jet engine inspired crown bearing an engraved, wave patterned Airbus logo. The case of the RM 50-02 is made in Titanium-Aluminum (TiAl). This intermetallic alloy has characteristics that stand between metals and ceramics, with physical properties characteristic of a metal with mechanical properties resembling ceramic. It exhibits an extreme rigidity and is much lighter than classical titanium alloys. This Titanium-Aluminum is the same alloy as that used in the Airbus for its jet turbine blades, which must function safely under the convergence of high temperatures and high fields of pressure, thus requiring a very strong and highly stress resistant material. The main difficulty of preparing TiAl comes from the very large difference of the melting points of its two major components titanium and aluminum. Successive heating in a plasma oven ensures good homogeneity of the TiAl ingots used to machine the case of the RM 50-02. The bezel in Titanium-Aluminum has been created with second bezel in ATZ white ceramic. This high quality ceramic is based on aluminum oxide powder injected at a pressure of 2,000 bar. This high-pressure injection increases rigidity by 20-30% and reduces the material's porosity to an absolute minimum. ATZ has the reputation of being a particularly scratch-resistant material —1,400 Vickers—, and possessing an unchangeable color. After diamond, it is one of the hardest materials in the world. A long and difficult machining process using diamond tools is necessary to create the complex form of this bezel, which is given a final matte surface finish. These qualities make it the ideal material for the front of the watch, an area highly exposed to impact and abrasion. The case is assembled with 20 Torq set® screws in grade 5 titanium and abrasion resistant washers in 316L stainless steel. The new Richard Mille RM50-02 ACJ Tourbillon Split Seconds Chronograph calibre also hosts a very unique and new dial layout. The dial features a power reserve indicator —70 hours— between 11 and 12 o’clock and a torque indicator at 2 o'clock that supplies information about the tension of the mainspring allowing the optimization of the chronometer function. This torque indicator located at 2 o'clock, supplies information about the mainspring’s tension, thus permitting the optimization of the chronometric functioning of the movement. Below 53 dNmm, the spring is considered to be too slack, while above 65 dNmm, the excessive spring tension can adversely affect the mechanism’s operation, or else actually endanger it. 'W' for Winding, 'N' for Neutral and 'H' for Hands a.k.a time setting. Additionally, at 9 o'clock a 60-minute chronograph register is located and at 6 o'clock a retrograde register for the split seconds. 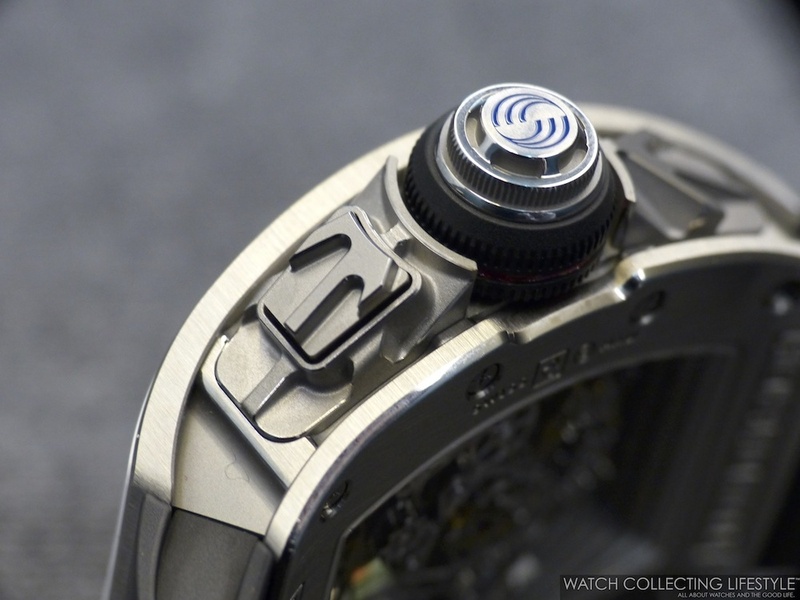 On the back, calibre RM 50-02 is fully visible via the display case back. This manual wound tourbillon movement with split seconds chronograph features a skeletonized titanium baseplate. The baseplate has been finished in grade 5 titanium, a biocompatible, highly corrosion-resistant and remarkably rigid alloy, which enables the gear train to function effortlessly. The alloy is 90% grade 5 titanium, 6% aluminum and 4% vanadium. This combination further increases its mechanical properties, which explains its frequent use in the aerospace, aeronautical and automobile industries. The baseplate of the calibre RM50-02 has been optimized to achieve an extreme weight/resistance ratio. The bridges of the calibre RM50-02 are made of grade 5 titanium. To give more depth to the calibre, some bridges are made of stainless steel and given a golden appearance by treatment with aircraft coatings. One of the new characteristics developed for the split seconds tourbillon RM 50-02 is the virtually complete elimination of initial jumping in the chronograph seconds hand. Moreover, the development of a new generation of split seconds components meant that energy consumption of this function could be lowered by approximately 50% through the reduction of friction within the movement and the elimination of the inertial jumping of the chronograph’s hands during stopping and starting. This was achieved by research focused on the working of the split seconds’ arms. Additionally, the new Richard Mille calibre RM 50-02 features a modular time setting mechanism fitted against the case back. This mechanism provides several advantages for longevity and maintenance. Since the component is mounted outside of the movement, the time setting assembly can be changed without affecting the integrity of the baseplate in the event of a possible defect or during maintenance. The mounting and dismantling of this module from the back will not require the removal of the hands and the dial. The design and execution of the watch demonstrates a complete conceptual approach to the movement, case and dial. As a result, everything has been constructed according to an extremely rigorous specification, in the manner of the analytical engineering methods used in the design of Formula 1 racing cars where the chassis and the engine are developed in complete harmony. For example, a casing ring is no longer used and the movement is mounted on chassis mounting rubbers (ISO SW) fixed by 4 titanium screws. Features such as these are evidence of uncompromising workmanship. The watch is rounded out by a ventilated white rubber strap with the classic Richard Mille double folding clasp. The buckle is made of brushed titanium. On the wrist, the watch wears true to its size and extremely comfortably thanks to its tonneau-shaped case. Just like with any other Richard Mille timepieces we've reviewed, this is one of those watches that you just don't want to take off. Its looks, inner workings and the craftsmanship behind it, make Richard Mille one of our favorite brands and a brand that is always at the forefront of innovation. Yet another amazing launch from Richard Mille that will make our SIHH 2016 even more memorable. The new Richard Mille RM 50-02 ACJ Tourbillon Split Seconds Chronograph is available in a limited edition of 30-pieces and only through authorized Richard Mille boutiques. Sticker Price $1,050,000 USD. For more info on Richard Mille click here. Posted on January 24, 2016 by Editor & Publisher and filed under Richard Mille, SIHH 2016, SIHH and tagged Richard Mille RM50-02 ACJ Tourbillon Split Seconds Chronograph Richard Mille SIHH SIHH 2016 Most Popular.